Drop lines are most useful for distinguishing marks and calling out their position in the view. For example, in a view that is dense with scatter marks, you can turn on drop lines to show the position of a particular data point. When you add drop lines a line is extended from the marks to one of the axes. You can choose to show drop lines all the time or only when a mark is selected. 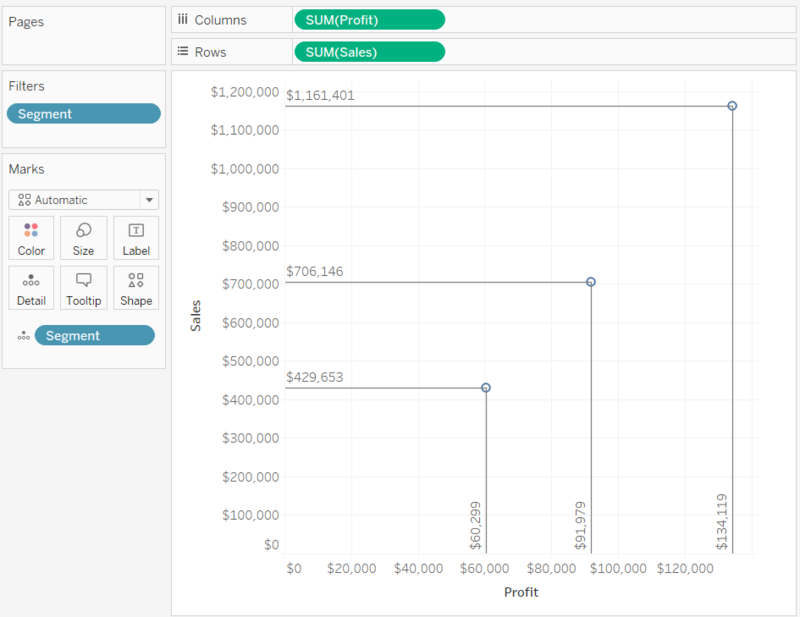 Drop lines do not display when you publish a view to Tableau Server or Tableau Online. To add drop lines to the view, right-click on the pane and select Drop Lines > Show Drop Lines. By default, drop lines are set to only show when the mark is selected. You can change this setting and specify other options in the Drop Lines dialog box. Right-click on the pane and select Drop Lines > Edit Drop Lines to open the Drop Lines dialog box. 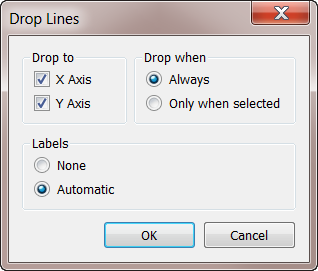 In the Drop Lines dialog box select an axis to draw the line to, whether to always show the drop lines, and whether to show labels.